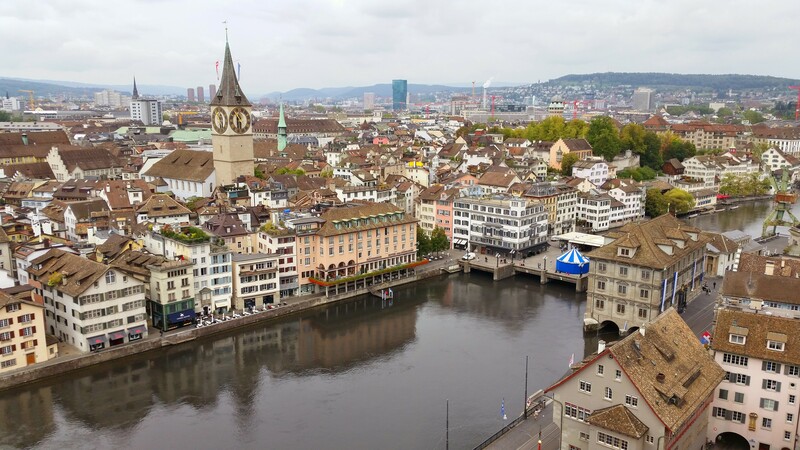 Before I talk about Zurich, it’s worth pointing out that this is my 100th blog post. Woohoo! Although I’ve been traveling internationally for the last dozen years or so, I only started this blog before my big Europe trip last year. It’s kind of crazy to think that I’ve found that much to write about in that time and even more crazy to think about those of you who have been with me from the beginning (or the middle, or just since yesterday 🙂 ). Thanks for reading, commenting, liking, and sharing my blog! Now, onto Zurich! 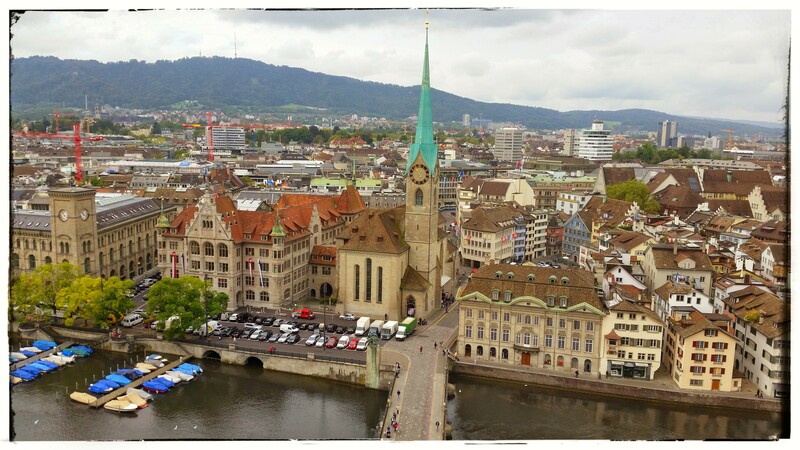 Although today was our only full day in Zurich, we didn’t end up doing a whole lot. We’re both at the point in our trip where we know we’re going home soon (tomorrow) and we’re kind of ready to be home, so that, in combination with the fact that we didn’t have much left on our to-see list and that it was drizzly all day today, meant we were fine having a light day. And I think that’s great! It is vacation after all, right? 🙂 Your vacation is what you make of it. Of course, both Scott and I like to make the most of our time when we’re traveling, but if we (or you!) want to have a light day, that’s A-OK. So what did we end up seeing today? We started off with a trip to Predigerkirche (Preacher’s Church), which is literally down the street from our apartment (a block away at the most). Interestingly, it’s attached to the central library in Zurich and they also don’t seem to have regular services there. Although it’s full of pews, it’s also got comfortable seating along the sides, has a counselor on-site should anyone want to talk to one, and the space is often lent out to various faith groups for their services. So cool to see a church really serving its community like that! There’s no charge to get in and there was nothing happening when we were there, but it’s worth stopping in when you’re in Zurich. 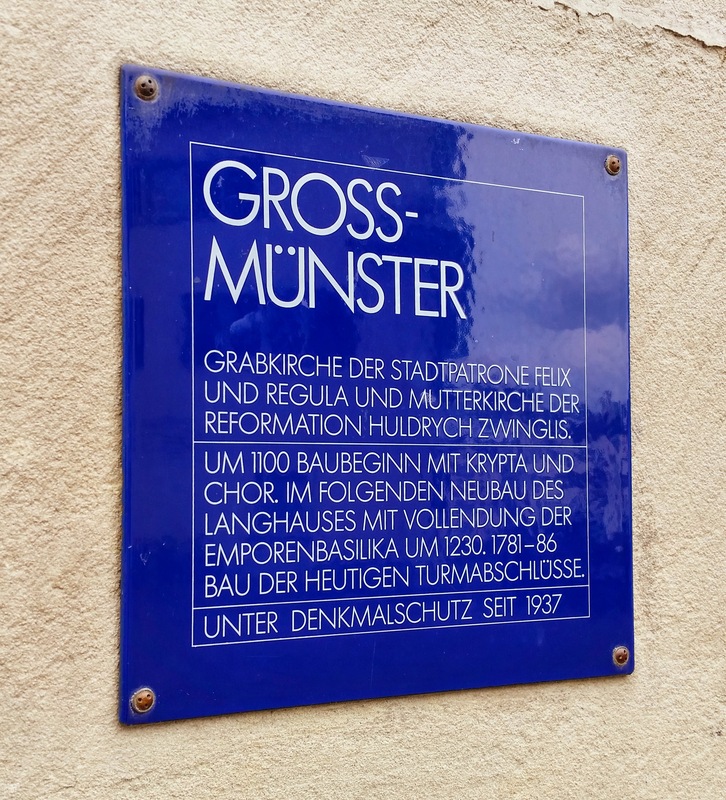 From Predigerkirche, we moved onto another church – Grossmünster. As you’ll no doubt recall from yesterday’s post, we saw the outside already, but didn’t get to go inside. 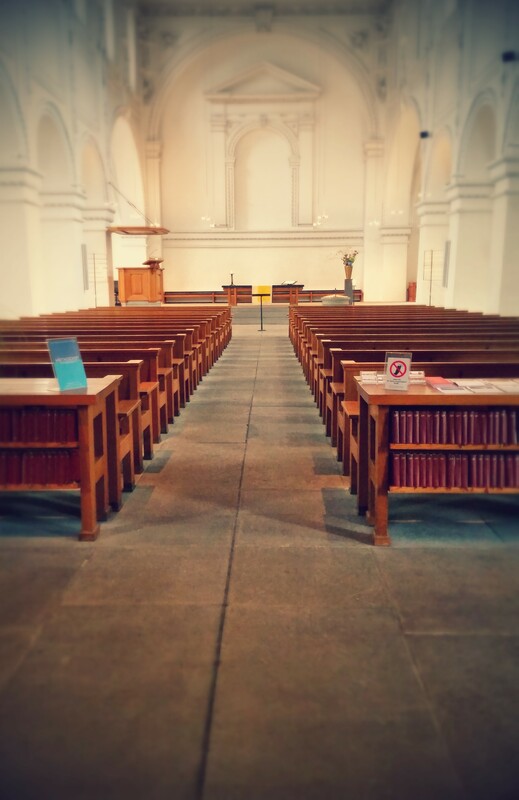 As with Predigerkirche, it’s free to enter the church and they also don’t seem to have regular services. I’m not positive on that, but the lack of any kind of altar and the references within the church to it being a “house of prayer” vs. a “house of worship” made me think so. 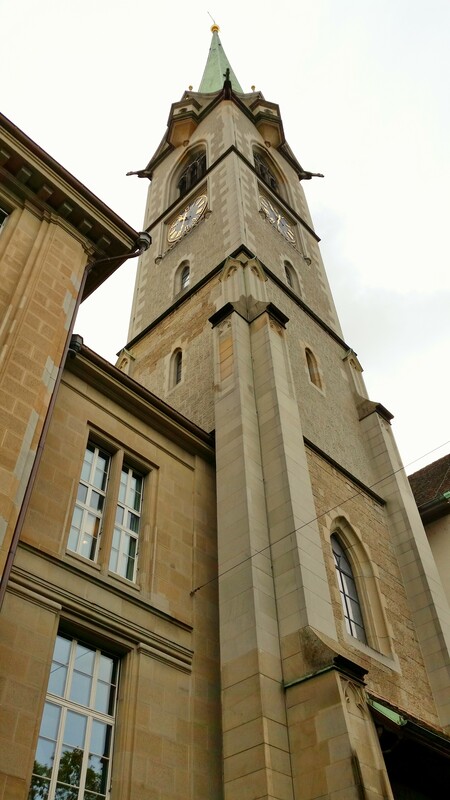 Because Grossmünster has two towers, we assumed/hoped it would be possible to walk up one of them and that was indeed the case. 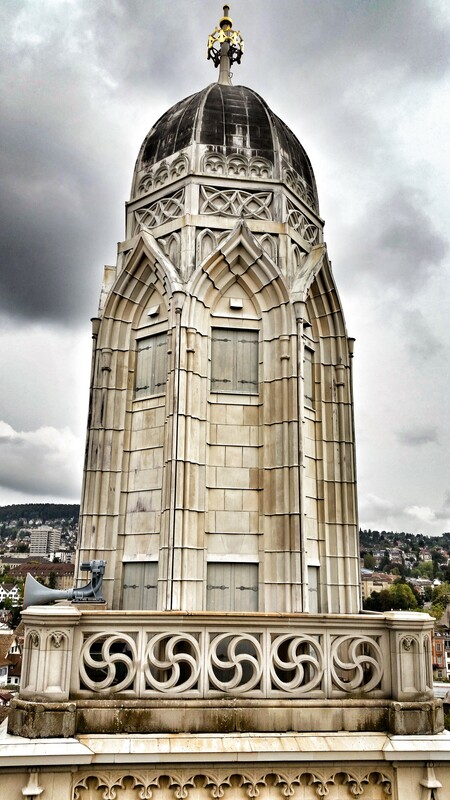 For a small charge (2 CHF/$2.14 USD), you can walk up the 225ish stairs to the top to get some great views of Zurich. Definitely do it! A word of warning about the walk up though – you start on a very tight spiral staircase, so it may not be a good idea to do it if you’re claustrophobic. About halfway up, you start climbing up wooden staircases, which aren’t as tight, but the steps seemed kind of big, so keep that in mind. The views at the top will make the climb worth it though! Our third stop of the day was yet another church (noticing a theme here yet?) – Fraumünster. As one of the three main churches of Zurich, I was surprised that this one was also free to enter and also didn’t seem to have regular services, functioning more of a house of prayer like the other two churches we visited. There’s no tower to climb in this church and you aren’t allowed to take pictures inside, but I think churches are always great places to visit when you travel because they’re often very beautiful and are almost always very steeped in the history of the town/city they’re in. Finally, we ended the day with a short walk to Lake Zurich, just down the street from Sprüngli. We snapped a few pictures and watched people feed the swans there, but didn’t do much else as the rain started to become more constant then. So we decided to head back to our apartment (stopping for a nice lunch along the way) and just chill out for the rest of the afternoon. We went through pictures, caught up on the interwebs, and had a good time just being on vacation before our flight home tomorrow. Don’t leave yet! Check out today’s (smaller selection of) pictures first! Looking up the steeple of Predigerkirche. The inside of Predigerkirche. Like I said, no altar, which felt a little weird. 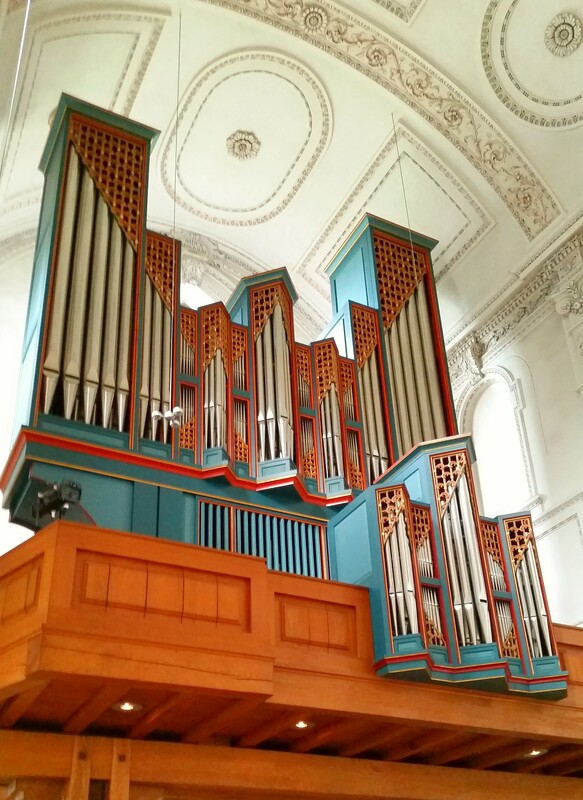 There’s still an amazing pipe organ in Predigerkirche though! 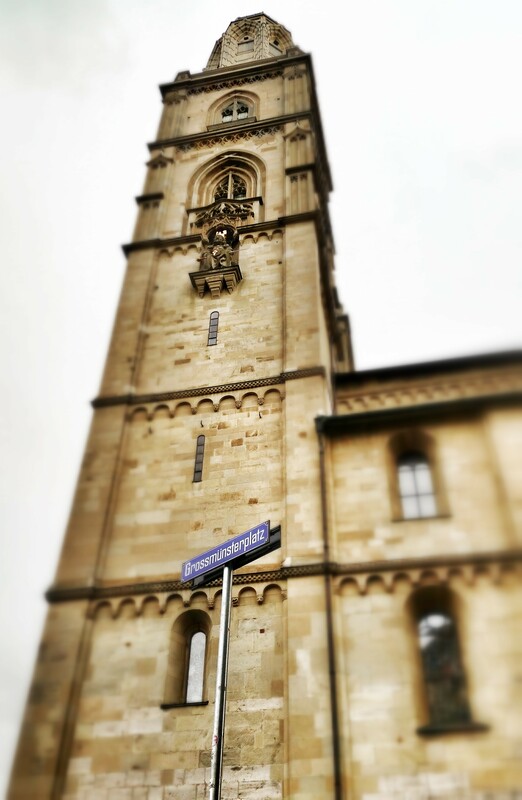 Coming up on Grossmünster again. 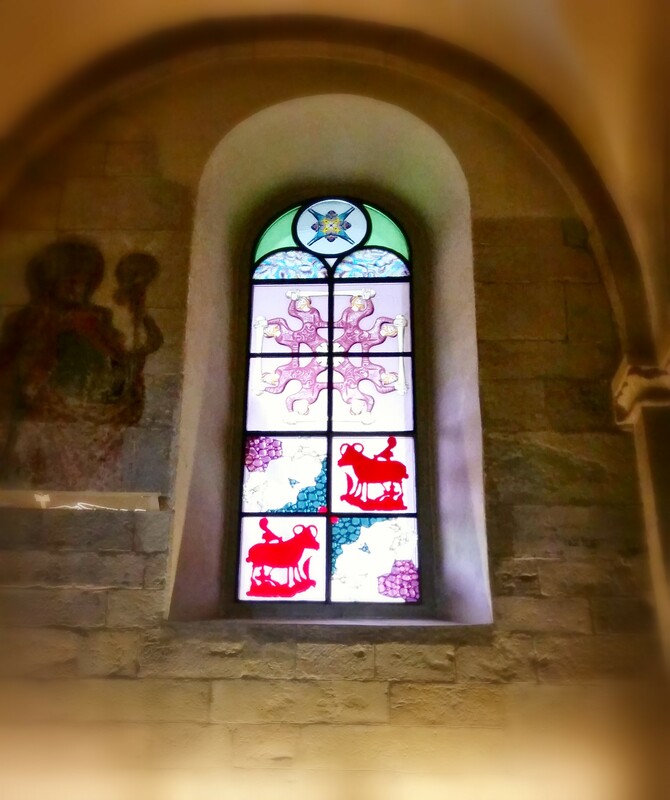 Although we weren’t supposed to take photos inside the church, I got one of this cool stained glass window. 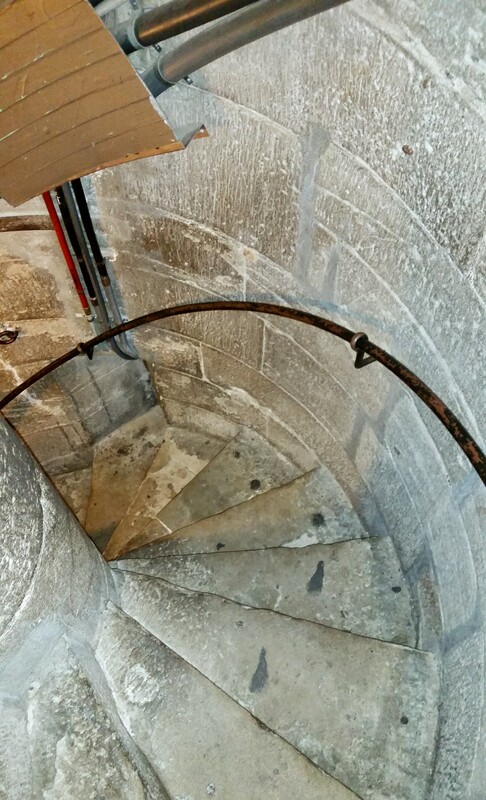 The spiral staircase you have to take to walk up the tower at Grossmünster. Looking from one tower to the other. A taste of the views from the tower. 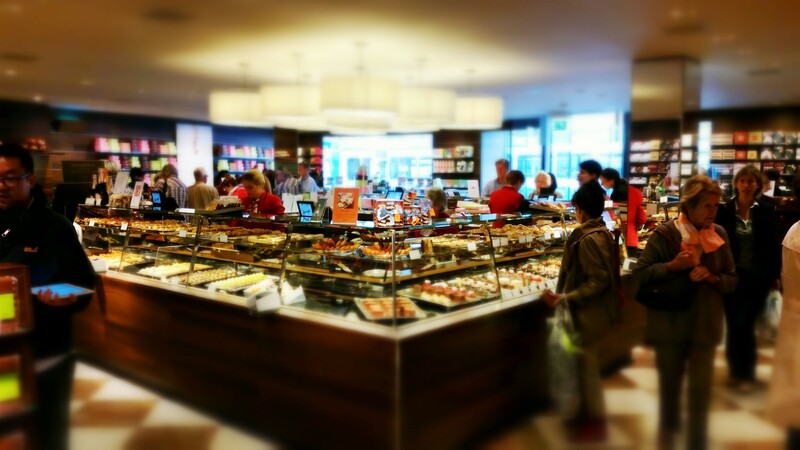 Shopping for chocolate at Sprüngli. A sample of our purchases. 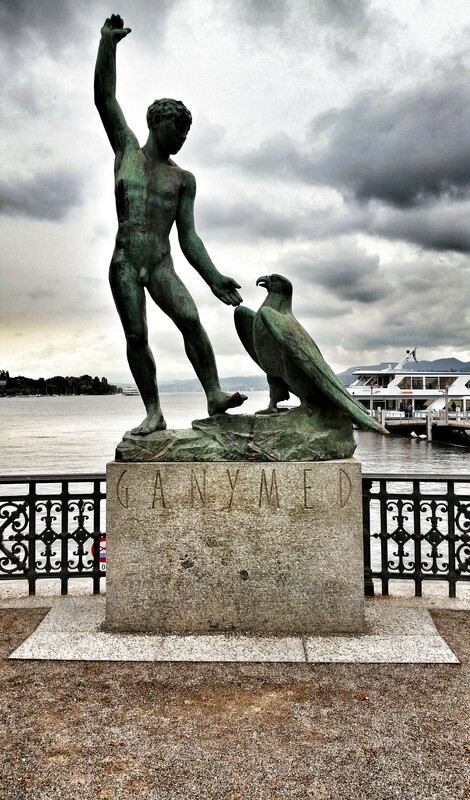 The Ganymed statue in front of Lake Zurich. Big congrats on your 100th post! That’s a cool accomplishment. 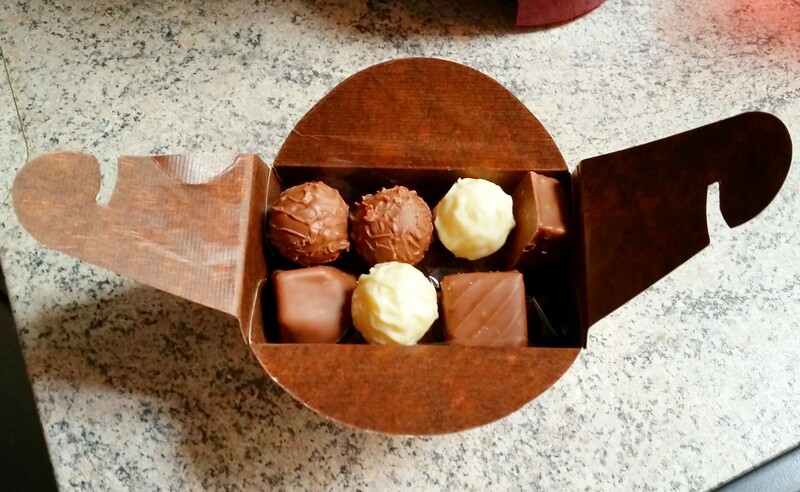 The spiral staircase looks simultaneously unnerving and amazing; whereas your chocolates look only amazing. 🙂 YUM.